Mr Reasonable - Not Respectable? In today's Barnet Times online edition there is a quote from Cllr Hillan concerning bloggers and citizens filming at council meetings. As part of the article there is a delightful quote from Cllr Hillan which say, “I do not think we would consider a request from bloggers . Only respectable media would be considered.” What a blinking insult! I am a perfectly respectable law abiding citizen of this borough, I pay my council tax and I contribute to my community. I go along to numerous council meetings where there is no press present (sadly often no members of the public either). I have reported back on meetings. Probably one of the best blogger reporters is Mrs Angry. Her depth of coverage, detail and accuracy puts the rest of the "repectable" press to shame. Cllr Hillan, I would respectfully suggest that you think again. Your own Government Minister, Bob Neill has clearly stated "There are recent stories about people being ejected from council meetings for blogging, tweeting or filming. This potentially is at odds with the fundamentals of democracy and I want to encourage all councils to take a welcoming approach to those who want to bring local news stories to a wider audience". Cllr Hillan, you are out of step with the people and you are out of step with your own government. Keep going and you will be out of office. Boy is the One Barnet programme expensive! In addition to the £2,000,000 already allocated to Agilisys as the One Barnet Implementation Partner, I read in the Cabinet Resources Committee Papers for 2 March, that a £500,000 call off contract has been awarded to the lawyers Trowers and Hamlins. The report notes that this £500,000 is likely to be the MINIMUM cost. Given that Agilisys billed £300,000 for their fees in December alone, this budget figure of £2.5 million looks like it could balloon upwards. Now what really worries Mr Reasonable is that if this One Barnet arrangement is going to be so complex that it needs £2.5 million on professional advice just to get it to the starting line of the contract, how much is it going to cost to monitor going forward and will it be so complex that it will become a legal minefield. At the same Cabinet Resources Committee they will push ahead with an immense outsourcing contract which appears to be at the heart of the One Barnet programme. I do not think there has been enough open and transparent debate on this programme - just lots of spin and sound bites. The costs are huge and the risks very significant. I am genuinely concerned that many councillors do not understand what this programme entails and what they are potentially locking themselves into. Reading what has happened in Liverpool with their Liverpool Direct Limited doesn't exactly fill me with confidence. I have tabled a few questions for the Cabinet Resources Committee about the outsourcing contract - whether they get accepted and answered, only time will tell but I have set them out below anyway. 1. Are the committee confident that the decision to press ahead with the preferred option is sufficiently robust to withstand any potential legal challenge given that there is no supporting evidence for any option other than the performance of the current in house team in any of the evaluation matrices and there is no risk assessment of any option. 2. Are the committee concerned that the Finance and Revenue & Benefits functions will be included in the outsourcing scheme even though there is no evidence to support this strategy other than the appetite of the private sector? 3. Can the committee confirm that they are not prepared to consider an in house option under any circumstances? 4. Are the committee concerned that, as there is no possibility of an in house option, key members of staff will start leaving the council in the intervening 18 months that it will take to negotiate a contract with the outsourcing company? How has this been addressed within the option appraisal risk assessment? 5. Are the committee concerned that this outsourcing report appears to be critical of the way the council has been run as evidenced at Appendix F paragraphs F1.5, F2.5, F3.5, F4.5, F5.5, F6.5 and F7.5. Who is to blame, officers or councillors and who should the residents hold accountable? I know this may seem boring but as I wrote earlier in the week this could have dramatic consequences for Barnet if/when it all goes wrong and in the mean time the council will have spent an awful lot of our money. Tonight Mr Reasonable attended the One Barnet Overview and Scrutiny Panel to ask so questions about the One Barnet programme and to get some answers. Well I got to ask my questions and I appreciate the courtesy I was shown by Cllr Yawitch who chairs this panel. But did I get the answers I was looking for? Not likely! 1. Agenda Item 5: Can the Panel ask the One Barnet Board to publish minutes of their meetings and make them available on the Barnet Council website as a way of enhancing the corporate governance of the Board. 2. Agenda Item 6: In the highlight report it states that the under the work stream New Relationship with Citizens that the project is complete. Can the Scrutiny Panel find out from the One Barnet Board when the citizens of Barnet will be informed what this engagement strategy entails and what consultation has taken place with residents that validates this strategy? a) Can the Panel ask the CRC why they feel it is necessary to recommend “That the Director of Commercial Services be authorised to initiate the procurement of a private sector partner(s) to deliver the following services: Customer Services, Estates, Finance, Human Resources, Information Systems, Procurement, Revenues and Benefits” before the outcome of the business cases is known or has been reviewed or consulted upon by other scrutiny committees/panels. Even issuing an OJEU notice sends a clear signal to bidders, residents and Barnet Council staff that the decision has already been taken. b) At Annex 1, 4.4, The key risks associated with delivering the recommendations of the options appraisal, are the panel concerned that under the risk assessment no mention is made of the quality of service provided, of the satisfaction of the residents, of the lack of flexibility leading to the sorts of problems experienced on the Fremantle/Catalyst contract. Are Panel members concerned that there appears to be no evidence of a detailed risk assessment involved with each option? c) Given the level of resources the council are currently putting into cost saving measures and the amount they are spending on interim staff to make improvements to the way services are operated (such as procurement) do the Panel consider that this strategy seem to be somewhat premature and it will allow the private sector to pick up a service which will have already born the costs of consultants, reorganisation specialist and redundancy funded by the council tax payer. d) Have the Panel been provided with benchmark evidence of a successful outsourcing within another local authority on the same scale and complexity proposed in this item and if so do they think it is worth sharing with the residents to help allay concerns that exist. If not, are panel members concerned that Barnet is being used as a testing ground for an untried system. e) Are panel members concerned that having spent a fortune (£8 million) on an SAP system in 2005 and spent millions each year in consultant support the report states at point F5.6 (page 79) that “IT systems need to be joined up to enable cross-system flow of data and information to provide real insight”. Will the panel request that the CRC challenge senior officers as how this situation has been allowed to arise? f) Can the Panel ask why, given the findings at table 7, consolidated service analysis of the option appraisal report which states that both Finance and Revenue and Benefits are performing well, these two elements should be included within this out sourcing exercise? Are the panel concerned that the only element of the Revenue and Benefits that is not performing well is the National Non Domestic Rates function and that the report appears to show a direct correlation between the 40% cut in staff and the decline in performance? Based on the foregoing, are the Panel members, like me, puzzled as to how the scoring for Revenue & Benefits at page 97 has been decided. Unsurprisingly the answers did not give me a great deal of comfort. No they will not publish the One Barnet Board minutes – and even the Councillors on the Scrutiny Panel members don’t receive them! The engagement strategy is no longer a strategy it is a set of principles but no you are not getting them! Then we got into the meat of the outsourcing options appraisal. The answers gave me no confidence that this outsourcing project is robust and what became clear is that the council are determined to seek a private sector partner to run these services because it is their political belief that private sector is the only possible provider. Cllr Rams stated that they had undertaken soft market testing and there was interest from the private sector in running council services. Well what a blinking surprise. It’s a bit like walking up to a car salesman and saying “I’ve got a bike – do you think I should buy a car?” And you think he is going to say no? So where does that leave all those council workers who are currently working hard to deliver huge service efficiencies. Well work hard for the next 18 months while we negotiate handing over your jobs to the private sector. Andrew Travers mentioned the problem that the Barnet Primary Care Trust had experienced when it was announced that they were being disbanded - key staff just walked away. Well once the staff in Barnet Council realise that all their hard work is going to benefit some large private sector company perhaps they will start walking away too. As I said to the Scrutiny Panel, this contract will run to hundreds of millions of pounds. If/when this all goes horribly wrong, residents will quite rightly ask why you didn’t challenge them more closely. It is a very complex subject and I apologise if this is boring. But trust me, this has the potential to fundamentally damage Barnet to its very core. If you think the Catalyst contract was a problem this has the potential to be many time worse and it is all being done in the name of political dogma. I got a sense that some of the Conservative councillors were deeply uncomfortable about this process. I just hope they have the common sense and integrity to stand up and be counted when it matters. Mr Reasonable has just spotted that the revised supplier payments list has been produced;(it may have been helped along by a question which was submitted to tonight's Chipping Barnet Residents Forum). In the original version published on 31 January, 756 entries had been redacted. The latest version out this afternoon has 467entries redacted. This suggests that 289 entries were originally incorrectly redacted, not just one of two. Although this is an improvement I note that there are still 69 entries of consultancy fees which are redacted, something I find hard for the council to justify. According to "Local Transparency - A Practitioners Guide to Publishing Local Spending Data" there are very few reasons for not publishing data and all of those seem utterly reasonable and understandable. I shall spend some time going through the data and see where the differences exist and I will keep you posted of my findings. Another consultant - but is everything as it seems? I noticed today a delegated powers report signed on 15th February 2011 authorising the use of a company called CCMPS ltd to fill the role of Assistant Director Commercial Assurance for the next 12 months. The report states that having searched for a new Assistant Director they have failed to recruit a suitable candidate so they have gone to a company CCMPS to supply a qualified consultant. "CCMPS Ltd. (consultancy) identified a professional with the skills, experience and commercial acumen required to lead delivery of the Council’s objectives in relation to commercial activity". This makes CCMPS sound like a big firm. However on closer scrutiny it transpires that this company was only formed in February 2010 and has yet to submit accounts. The directors of CCMPS are a Mr and Mrs Malyon. Now would that be Mr Chris Malyon who was the interim Assistant Director of Finance at Barnet Council from February 2010 and according to his linkedin profile has been the in the post of assistant Director Commercial Services (the one for which they are seeking authorisation) for last four months. 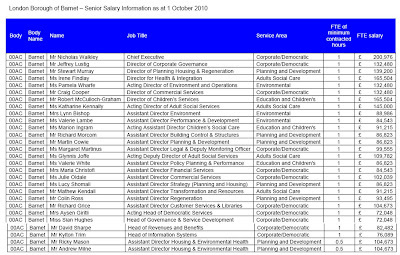 - who will be at the council for the next year at a cost of £650 a day (£169,000 per annum). The report states that any shortfall in the salary costs between the permanent post (£119,560 - £130,300 inc on costs) and the consultants cost will be met from "the Council’s Transformation Reserve as approved by the Chief Finance Officer" (another consultant). The report concludes that, "After 12 months the Council will go through the necessary recruitment procedures to appoint permanently to the AD Commercial Assurance role". Maybe I'm old fashioned but something here just doesn't seem right to me. If ever there was an example of what is wrong at Barnet Council it could not have been set out more clearly than in response to a question to tonight's cabinet. The question asks how much of the £157,000 saving generated by the cutting the crossing patrol staff represented their salaries and how much was for central overheads. Well the shocking answer is that the crossing staff salaries account for just over one quarter of the total cost. 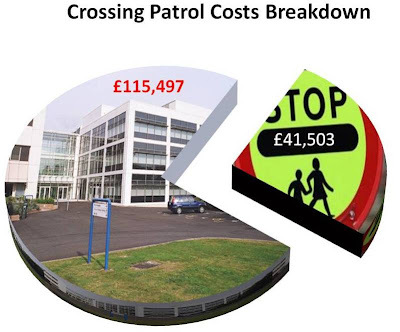 Just £41,503 of the cost of crossing patrols is for staff. The other £115,497 is for management, HR and IT. To me the answer is obvious keep the crossing patrols and get rid of the colossal management overhead at North London Business Park. I also wonder how much of this inefficiency is replicated elsewhere.I would also like to bet that much of that £115,497 saving is never actually achieved. Reviewing the October to December supplier payments I notice that during this three month period LogicaCMG UK Ltd have been paid just over £1.2m (£302,558 on consultancy fees,£12,689 on IT Services, £19,000 on software purchases and £867,672.02 on software licenses and support). Looking back through the previous supplier payments it appears that they were paid £52,470.93 in the period July-September and £791,744.98 in the period April-June. In total, for the first nine months of the financial year that comes to the princely sum of £2,046,134.93. Just what are Logica doing at Barnet that is so expensive and why aren't councillors at least asking the question. I suppose this makes the £150,625 replacing the air conditioning units in the data centre at NLBP seem quite modest by comparison. I know that a decent IT system can be essential tool for running a successful business but staying solvent also helps. Given budget pressures we face are we absolutely sure this cost could not be reduced? Looking through the supplier payments over £500 I note with interest that in December the Council paid invoices to Agilisys worth £300,718.80. I believe that Agilisys are the council's implementation partner for the One Barnet programme. Now in the papers for the forthcoming cabinet meeting there is a rather disparaging remark concerning public consultation which says, "Although many correspondents suggested alternatives to reductions in the specific service for which they were campaigning, this was almost all disappointingly vague – back office costs should be cut before frontline services are touched and senior staff pay and councillor allowances should be cut. None of the suggestions came near to meeting the financial challenge facing the council or the need to make substantial year on year savings." Well, from my perspective, there have been a number of very sound proposals to save money and cutting consultant costs was pretty near the top. I hate being told by the council that there are no alternatives when, to me, there are some very real alternatives to cutting front line services. It's all about priorities and in my humble opinion the council have got their's wrong. Last night Mr Reasonable attended the Special Committee (Constitution) at Hendon Town Hall. This is where councillors discuss amendments to the constitution. There were a number of proposed amendments to the way motions are dealt with in council meetings and it seemed to be proposing significant restrictions on who could speak. I was surprised there wasn't much more of a discussion about what seems to be an ever increasing restriction of councillors rights to speak. If I was a councillor I would have been kicking up merry hell but obviously I do not understand the subtleties of what was being proposed. I was there to ask about the role of public participation in the overview and scrutiny process. One councillor did ask why I had put forward such a modest proposal on public participation. I made the point that I would love to see a root and branch review of the way the council involves the public but that the current restrictions in the constitution meant that I could only address what was on the agenda i.e. the overview and scrutiny process. There followed much debate about the issue of public particpation, but the impression I was left with was that the ruling group really don't want the public involved. Part of me wonders why I bother going all the way over to Hendon just to be ignored, but my view is that if we don't keep reminding the councillors that they are supposed to be there to represent us, the residents, they will take our non attendance as a signal that what they are doing is ok - and it isn't! I found this on the council's website which may be of interest to people. It also helps to set my previous post into some context. 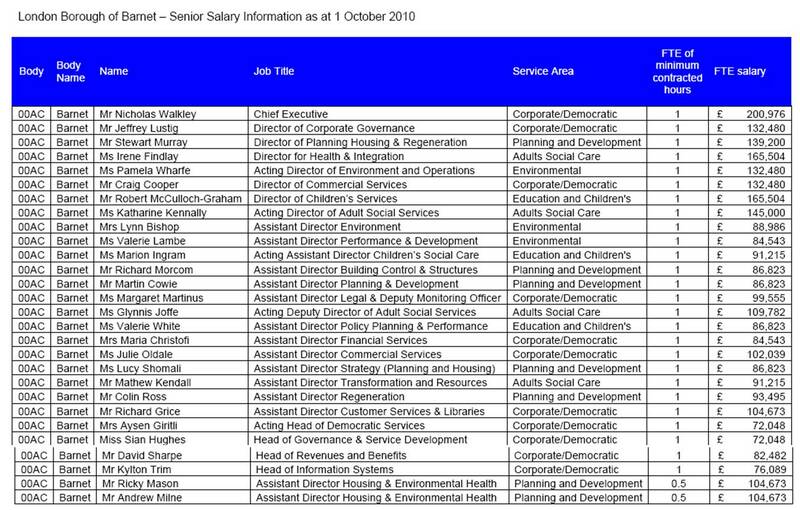 Of course it is missing the salary of the Deputy Chief Executive who, as we all know, is a contractor. Looking through the expenses payments I see that Advance HR Consulting is yet again in receipt of a decent slug of money, £27,000 in the last three months and £28,750 from Jul-Sept.Interestingly the sole director of this company is Mr Jason Wheatley Interim Resourcing, Performance & Talent Manager at Barnet Council. According to Mr Wheatley's Linkedin page he has been at Barnet since May 2009. Now don't get me wrong. I have no issue with Mr Wheatley. However I do have an issue with the council's strategy of employing subcontractors on "interim" posts who end up at Barnet for prolonged periods. 21 months in an "interim" post seems excessive to me. What do other people think? Well I am thrilled that someone from Barnet Council reads my blog! This evening, checking the council website I see that Pledgebank has got its own link in the sidebar. Well done Barnet. Where oh where has Pledgebank gone? Having spent rather a lot of money to build a beautiful Pledgebank website I thought I would take a look and see how it was doing. But where is this beautiful website? Not on the front page of the Council's website. So I enter Pledgebank into the search box. Up come lots of pages but none of them are Pledgebank. Wait, in the side bar of the Community and Living page is a link to Pledgebank. I click on it only to find it clicks through to the free, standard, UK Pledgebank website with Vicki Morris' pledge for the march on Sunday top of the successful pledges. I know I am trying to make this a bit humorous but actually it makes me rather cross. The Council has spent a lot of money building a bespoke Pledgebank website and then burying so deeply in the recesses of the councils main website that it is impossible to find. What a complete waste of money!